America's Pivot: "Stoking The Fires of Nationalism?" A recent article from a prominent China scholar calls into question America’s “pivot.” Is it worth it? Foreign Affairs recently carried an essay from Boston College professor Robert Ross that’s worth your time. Ross pronounces the Obama administration’s “pivot” to Asia “unnecessary and counterproductive.” The Wall Street Journal quotes him as contending that Washington is attempting “changes in the status quo” that compromise China’s security while “stoking the fires of nationalism.” Pushback from Beijing is a predictableand needless result in his view. Two quick comments. One, from time to time Toshi Yoshihara and I have jousted with Ross about the operational, tactical, and technical dimensions of China’s maritime rise. Rather than rehash that debate in detail, I would just add that he holds forth on scientific-technical matters—ranges, payloads, surveillance and targeting infrastructure—far more confidently than I or any other sea-service professional I have encountered would. For example, he states—as fact, not as one possibility among many—that China “has not yet mastered the technology” to deploy anti-ship ballistic missiles. He contends that the PLA Navy “has only just begun constructing a next-generation guided-missile destroyer.” That’s true if you focus solely on the Type 052Ds whose existence was confirmed this year—and overlook the DDGs that naval experts in China have been billing as Aegis equivalents for almost a decade now. And so forth. In short, Professor Ross is far more upbeat about the U.S. Navy’s margin of superiority over the PLA Navy—and thus about Washington’s capacity to project power across oceanic distances into a great power’s backyard—than circumstances appear to warrant. There’s an enormous amount we don’t know about Chinese platforms and payloads. Assuming away a competitor’s ingenuity is imprudent amid such uncertainty. Concentrating military power in the theater only makes sense—as it has since the Clinton and Bush administrations started realigning U.S. deployment patterns toward the Pacific, inaugurating a strategic pivot without calling it a pivot. And two, Ross hints at a strategic problem Beijing has presented Washington through its handling of the South China Sea and East China Sea island disputes.China’s leadership may have figured out how to revise great principles in trivial controversies. For instance, Ross finds U.S. backing for the Philippines and Vietnam “puzzling” because the islands command only minor economic and strategic importance. And so they do. 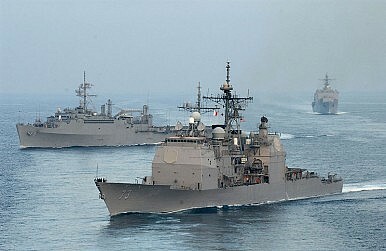 Who rules Scarborough Shoal or the Senkakus makes scant difference to the United States on a day-to-day basis. But principles underlying the U.S.-led liberal order are at stake. Occupying Scarborough Shoal, an atoll well within the Philippine exclusive economic zone, suggests that China can abridge the rules of the U.S.-led order within certain spaces on the map, and when Beijing wants to fervently enough. Or, grabbing the Senkakus from Japan would set a precedent that China can unilaterally repeal selected parts of decades-old peace treaties. Yet defending principle would demand American efforts of significant magnitude and indefinite duration—efforts far exceeding the practical value of this or that geographic feature. It’s also unclear what the United States would do—station a destroyer for picket duty off Scarborough Shoal, or in the sectors of Vietnam’s EEZ that China has sought to auction off for hydrocarbon exploration? Doubtful. In effect Beijing can dare Washington to waste resources on endeavors that appear remote to freedom of navigation, the administration’s chief stated interest in regional waters. If U.S. leaders accept the challenge, they embark on an undertaking that flouts cost/benefit logic. If they decline, they tacitly concede that China can rewrite the rules of the game in maritime Asia—including, presumably, those governing freedom of the sea. Quite the quandary. With a new directive China has appointed itself the sheriff over most of the South China Sea.